The first reaction to the new Spytunes! After launching the new version of Spytunes just a couple of days ago, I sent an email to all my current subscribers as I immediately had to switch them over to this new login, members system. This was off course my first, top priority. I’ve had the first reaction from one of my current subscribers, which was so great I asked if I could share it in a blog. That sounds great. Good on you for making the changes. I’ve been wanting to let you know that I think the material is excellent. I’ve benefited so much. I haven’t kept up with the 2 a week schedule, (bad student) but the initial material has been so potent (even just learning and understanding new chord voicings all over the fingerboard has been fantastic – I was laughing at how obvious it was) and I’ve integrated it into my band playing. I started by learning classical, and have stayed with that basic sensibility and technique, but I always owned a steel-string and an electric and wanted to develop sideways into new avenues. Like you, (but on a more modest scale), I was confused by the various possibilities to learn music via the guitar. The common teaching of rock/blues never appealed – I’ve never wanted to imitate the rock gods by learning their riffs, or the tired old songs. Stupidly, I was intimidated by all music theory – the general way it was presented seemed daunting and utterly unrelated to playing music – apart from the cliched minor pentatonic – so I remained stuck in muscle memory mode, trying to ‘get better’ at playing pieces – well, at least I learned to read music. I had zero ability to improvise or play other styles or find my own voice. This went on for decades – I’m 50 now. I’ve now begun to improvise with some confidence and have written songs that feel authentic. I can now develop musically in a broad and rich way. Your work has illuminated an exciting path forward. I wanted to share this reaction from Roger with you as this is what many players go through and a major part of why Spytunes exist. 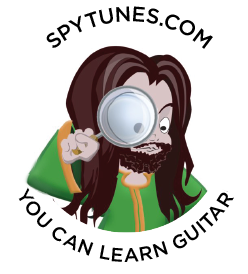 If you are new to Spytunes, Roger really sums up what it’s all about here. If you want to learn guitar and understand music, you must take songs apart and learn your chords and scales. In many cases, these two subjects don’t interact very well as they’re often taught in isolation. 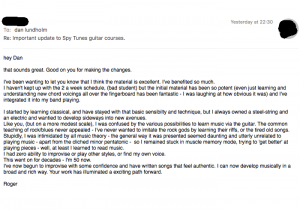 This is what Spytunes aim to fuse, understanding music and learning to play the guitar. If you’re a beginner, this might sound strange but as you heard from Roger, it happens all the time. What about all previous subscribers? Since I suspect some of my old subscribers, who have already completed a course already may read this, let me speak to you now as well. There are a few things I need to look at now that the new site is live but I will be in touch as soon as I’ve fixed these final details. I will email you with an offer to download the new Guitar Conspiracy 3.0 as well as give you a free trial to check out the new content, for example, the master course is now launched! I’m hoping to send this out by Wednesday. If you are unsure about being on my email list, get in touch.